Today we had the sad news of a terrorist attack against two mosques in New Zealand that killed 49 people. In addition to expressing our condolences to the innocent victims of yet another massacre in the name of political violence and religious fanaticism and their families, the news worries us also because the perpetrators of the brutal massacre onto the weapons used for the terrorist act infamous have reported the names of two Venetian heroes of our history, Marcantonio Bragadin and Sebastiano Venier, rising them to symbolize their bloody fanaticism. This juxtaposition horrifies us, as we categorically reject the use of historical figures of heroes of fundamental importance in Venetian history by crazy and violent terrorists and white supremacists. The action of our heroes must be traced back to an era of defense and survival wars that belong to a historical period of the past, of the glorious Serenissima Republic of Venice. It is first of all vile, as well as historically incorrect, to use these figures outside the pertinent area. Theirs is a historical military affair in the name of heroism and courage, certainly not the cowardice of shameful vile acts that kill unarmed and peaceful citizens in places of worship. No one dares to cite Venetian history for purposes of vile violence and terrorism, no one tries to appropriate our symbols of the past to propagate sick and delirious ideologies to the mark of religious fanaticism and racism. 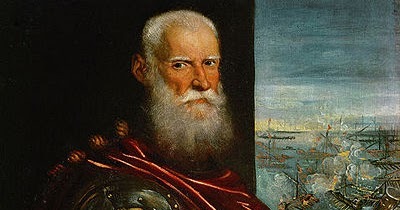 The Venetian history belongs to the Venetians, the Venetian heroes belong to the Venetians and to the whole of humanity and their memory is sacred and must serve as a future warning for the defense of peace, as our flag, the only one in the world that reports precisely the word PAX.